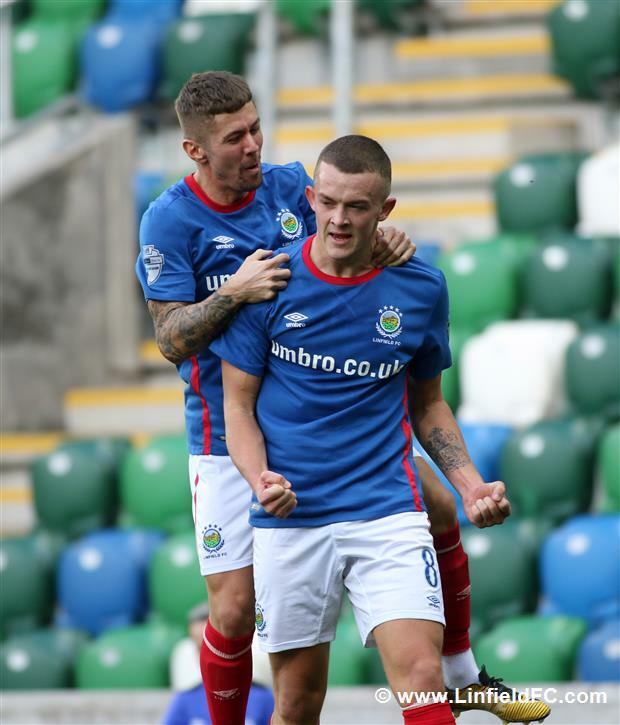 Linfield edged out Ballymena United in an entertaining tussle at Windsor Park this afternoon, coming from behind to win 2-1 thanks to goals from Michael O’Connor which keeps the pressure on league leaders Glenavon. 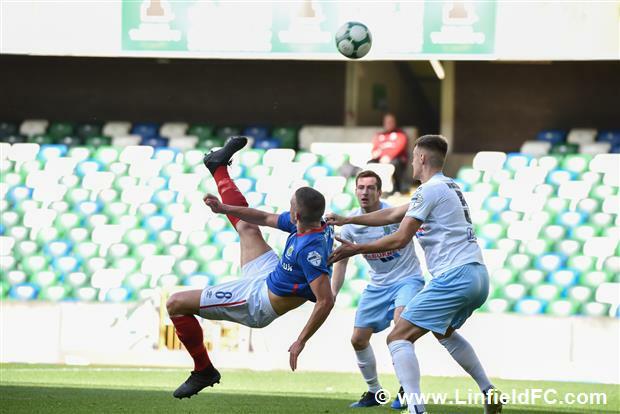 The Blues made a bright start with Josh Robinson glancing a header wide from Joel Cooper’s corner and Matthew Clarke having a low strike deflected into the arms of United ‘keeper Ross Glendinning. 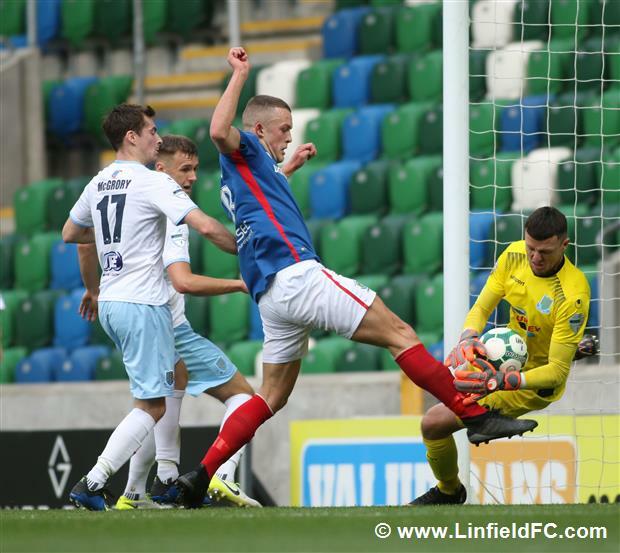 The former Linfield shot-stopper produced a top save moments later, getting down low to push Joel Cooper’s low shot away after Michael O’Connor’s neat threaded pass. 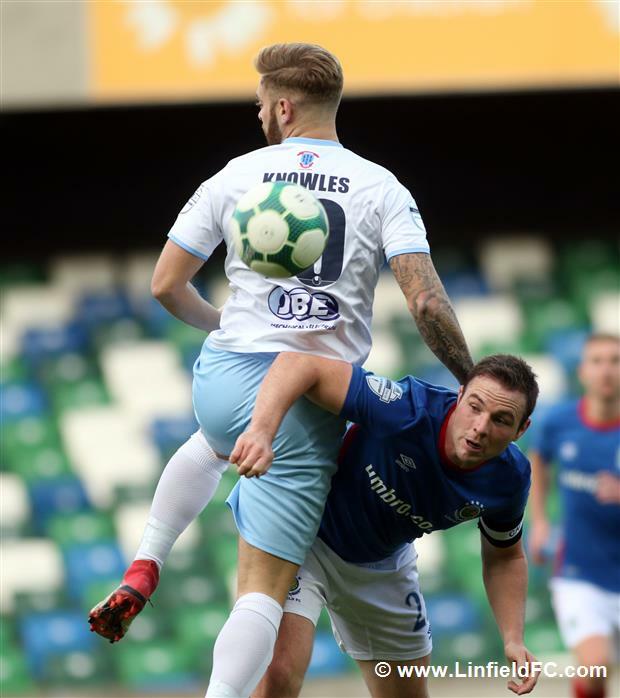 The Sky Blues went within inches of an opener themselves – a spectacular effort from defender Jonathan Addis as his overhead kick flew just wide, before Michael O’Connor headed just wide from a Kirk Millar cross up the other end in a lively opening ten minutes. 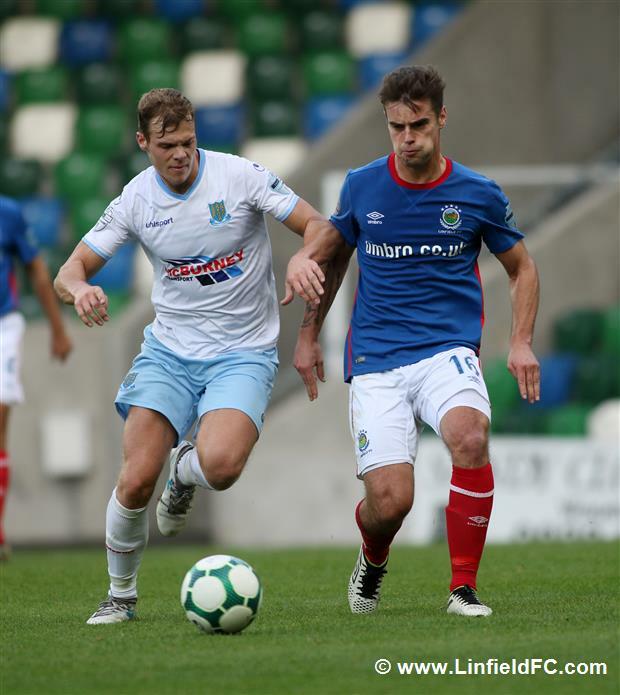 The break in the deadlock came on 12 minutes and it came for Ballymena despite all Linfield’s early pressure. 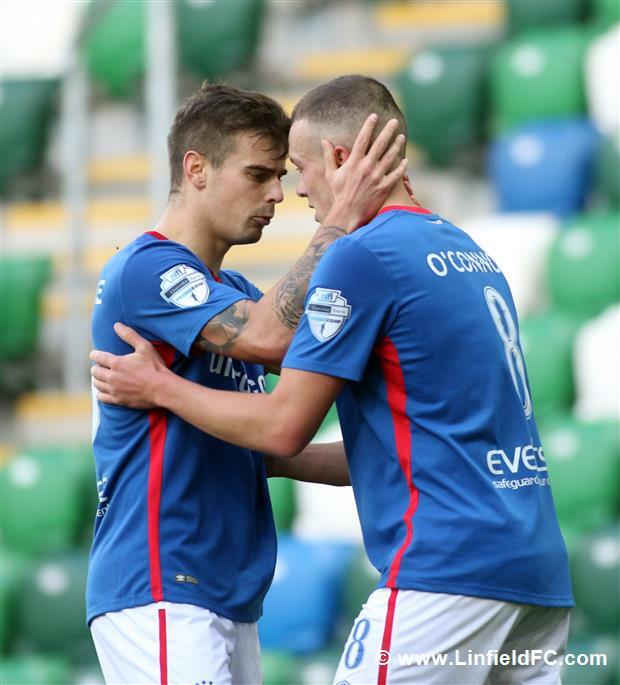 Leroy Millar fired in a corner and Cathair Friel got across his man to nod the ball into the far corner. 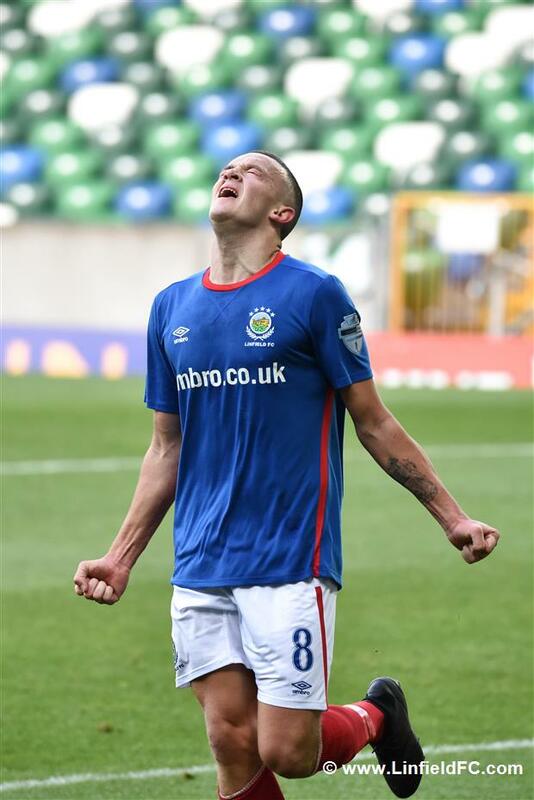 It was only Linfield’s second goal conceded in nine league games. 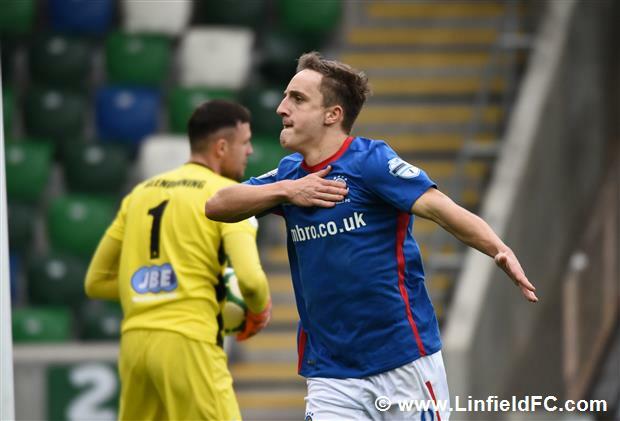 Chris Casement threatened next as Linfield searched for an equaliser, but his curling free-kick drifted just wide of Glendinning’s far post. 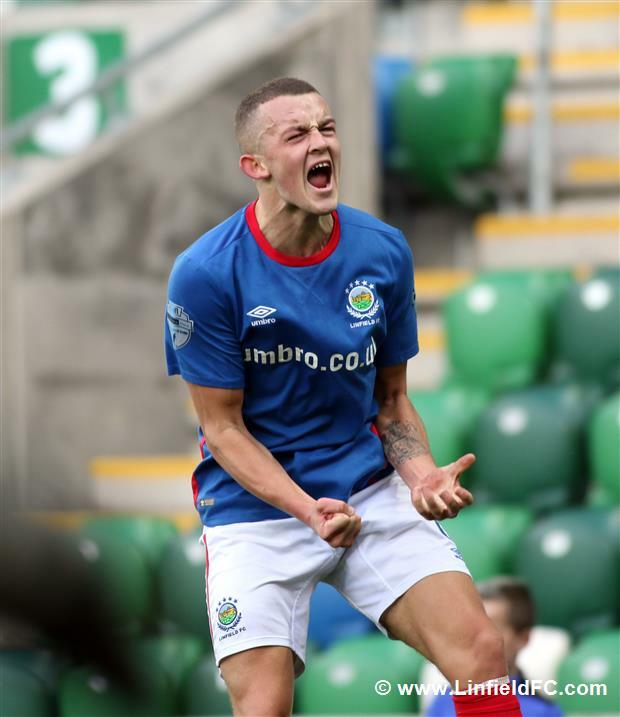 With the game at 1-0 and both teams pressing, the next goal was going to be important in the context of the game. 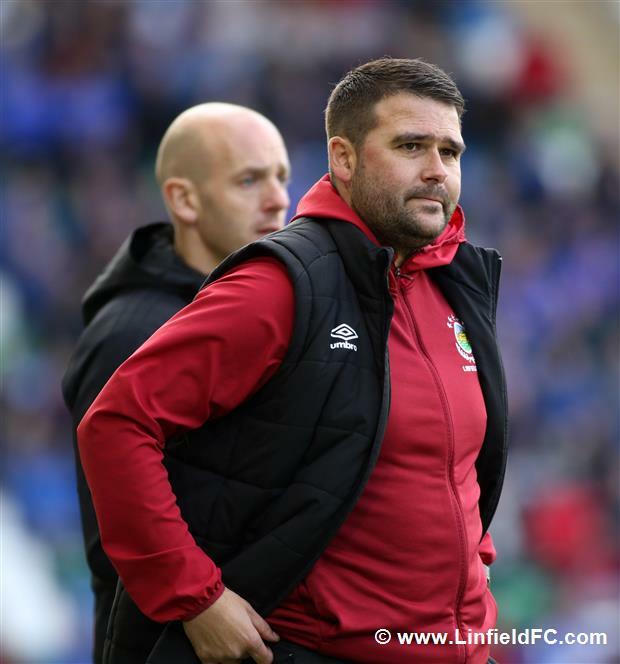 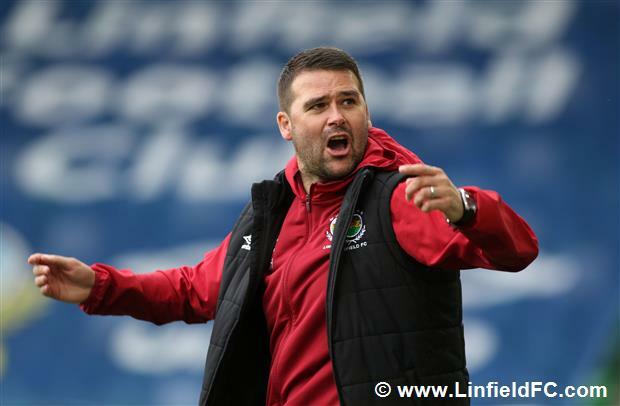 That goal arrived on the half-hour mark and it was a well-worked equaliser for David Healy’s Blues. 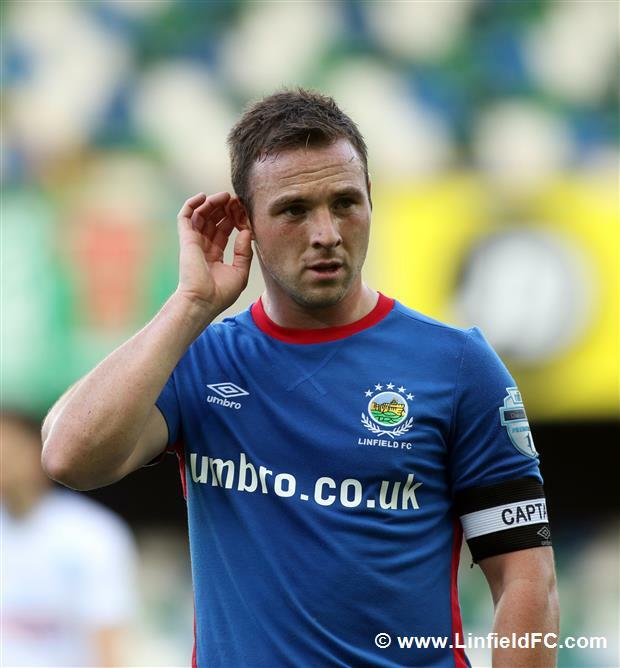 Captain Jamie Mulgrew spread the ball out left to Matthew Clarke who in turn slid the ball across the box for Michael O’Connor to force the ball into the bottom corner. 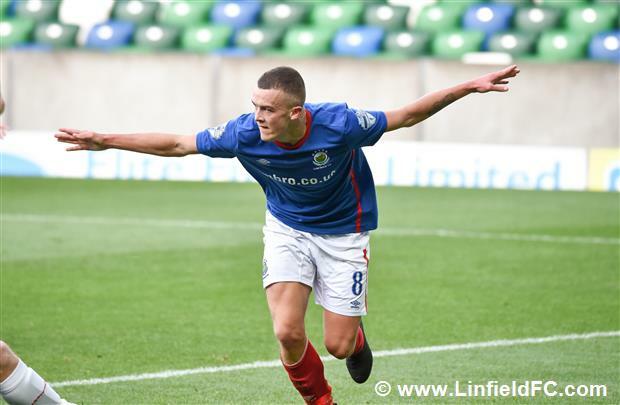 Over the course of the afternoon it was a well-deserved goal as he put in an excellent shift, holding the ball up superbly and giving the opposition defenders a tough afternoon. 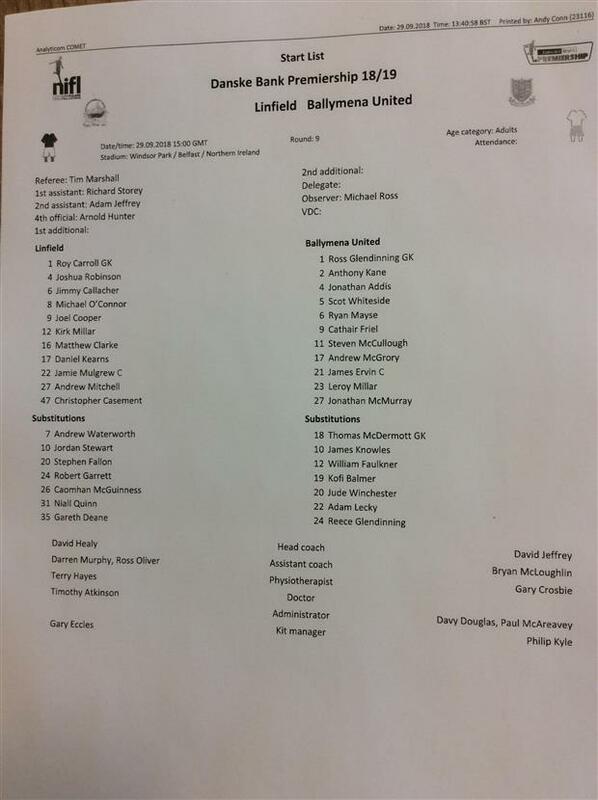 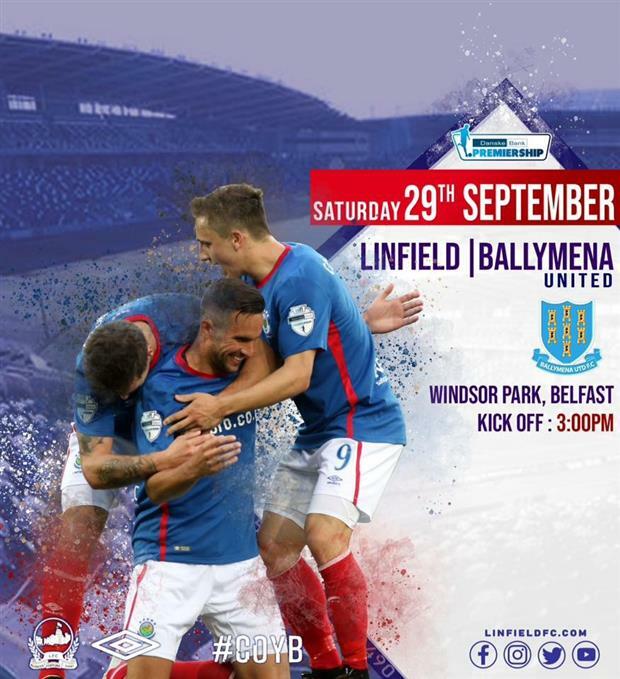 Linfield had strong appeals for a penalty waved away when Michael O’Connor’s effort was blocked by Scot Whiteside. 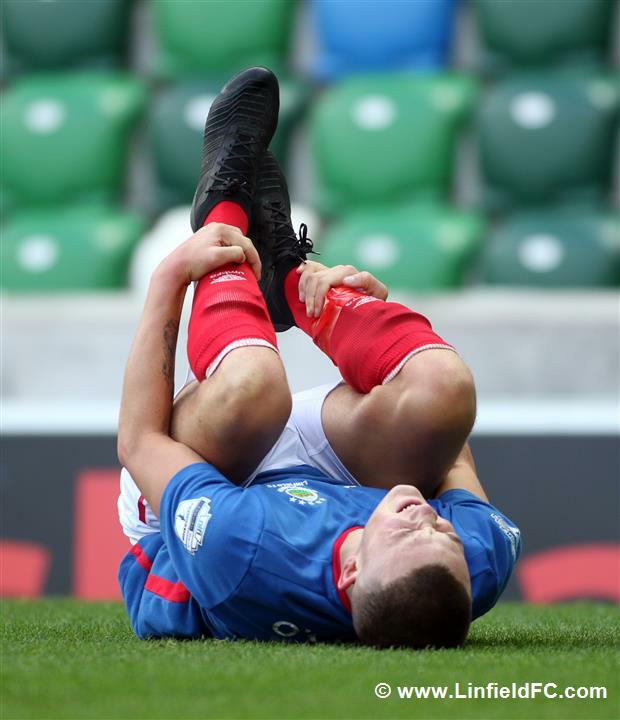 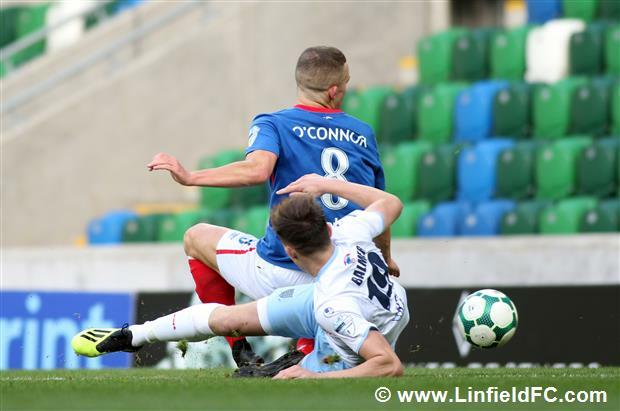 There were passionate appeals from the Linfield players who were adamant that the ball was handled by Whiteside on the face of goal to stop what looked a certain goal. 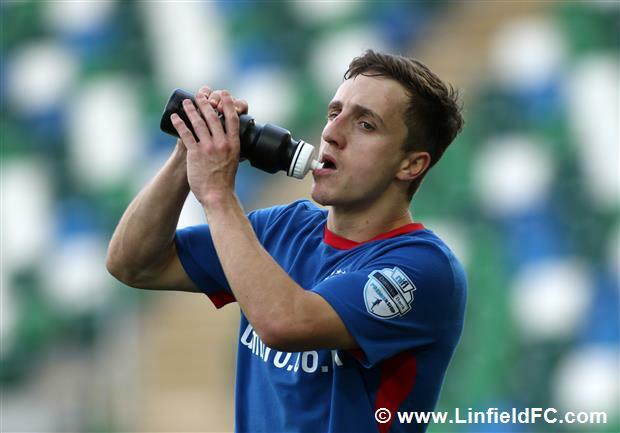 The industrious Joel Cooper produced the goods once again to give Linfield the lead on 57 minutes. 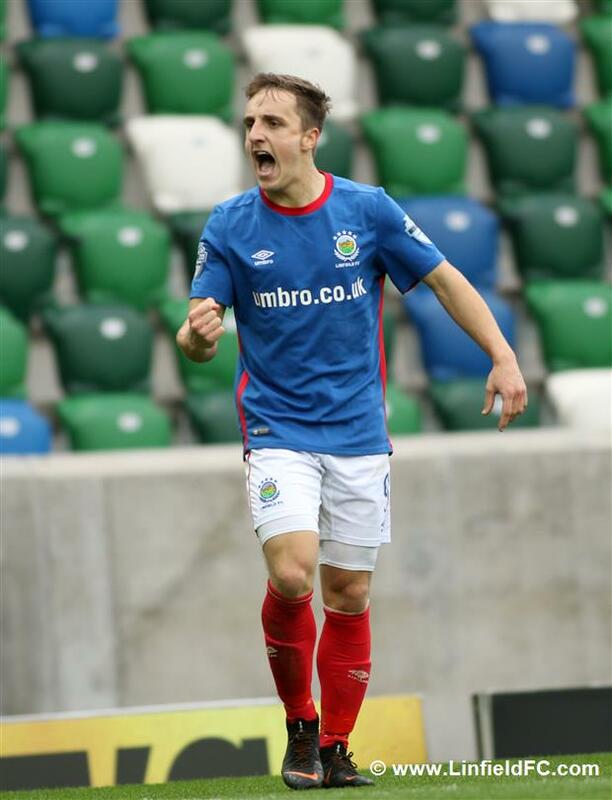 The summer signing from Glenavon bagged his fifth goal of the season and he took it so well, running onto Michael O’Connor’s flick-on, beating the defender and slamming the ball low in the far corner with his right foot. 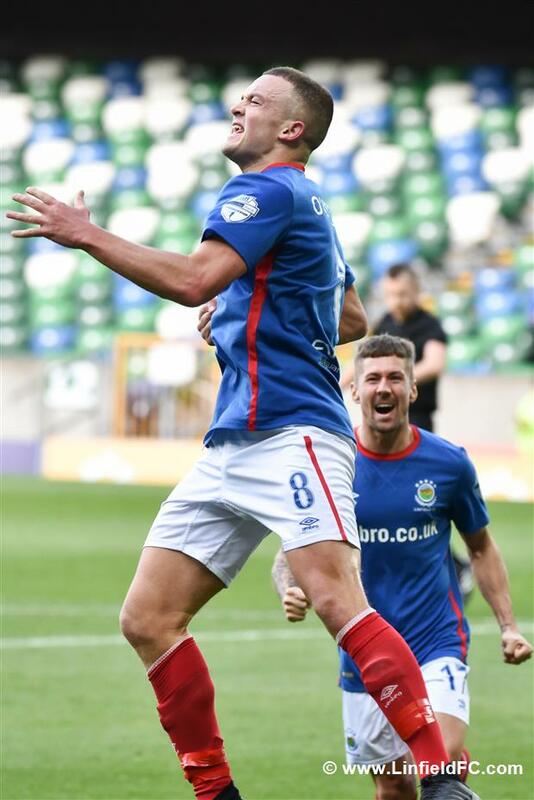 He really is becoming a fan favourite at Windsor Park as he celebrated with the elated Linfield supporters, who returned to the Kop stand for the first time since 2014. 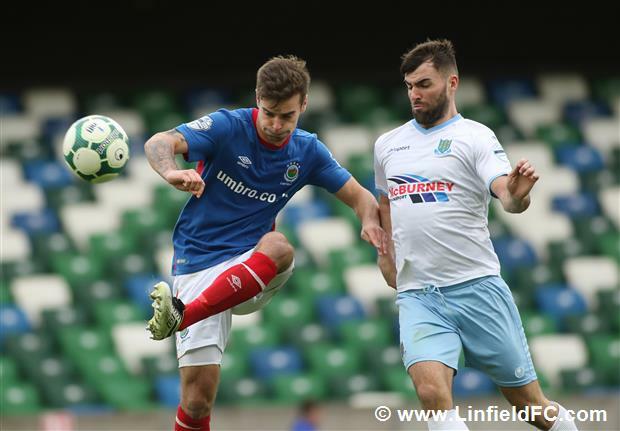 Chris Casement went close to what would have been a stunning third, watching the ball drop out of the sky and volleying the ball just past the far post from an improbable angle. 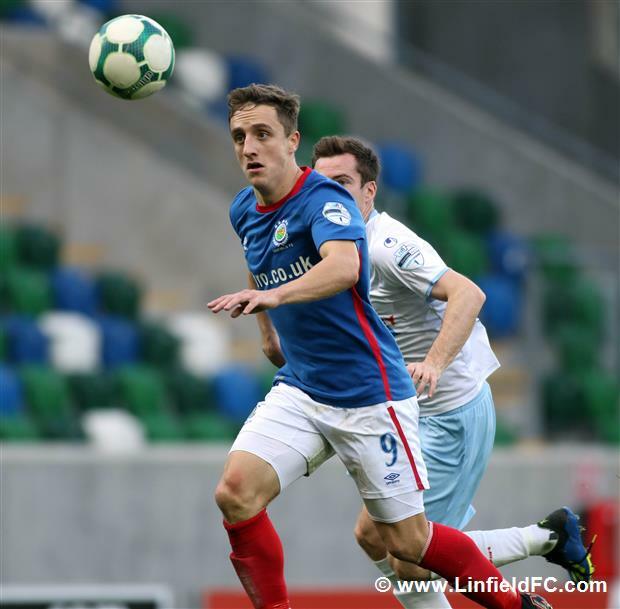 Kirk Millar was next to threaten when he rose well to meet Joel Cooper’s cross to the far post, he got good connection on his header but Ross Glendinning clutched the ball well with safe hands. 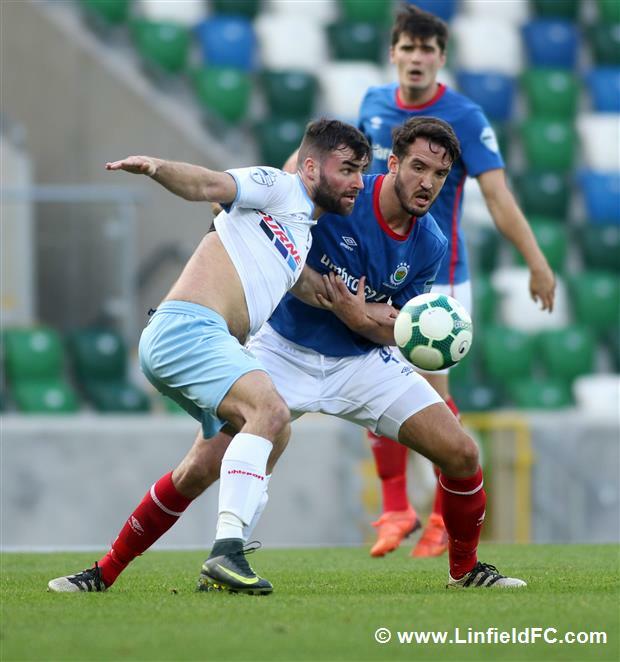 A glaring miss kept Linfield’s lead intact when Leroy Millar squared the ball across goal and Cathair Friel fired wide with the goal at his mercy, but credit must go to Matthew Clarke for getting in and putting the striker under pressure. 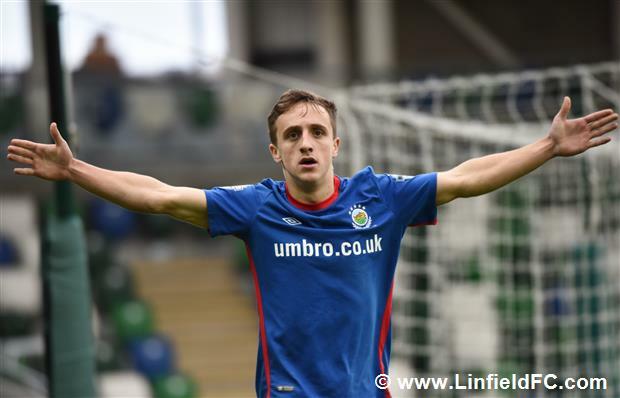 Tony Kane almost drew an equaliser for United with a free-kick from 20 yards, curling it goalward but just around the far post, a good effort. 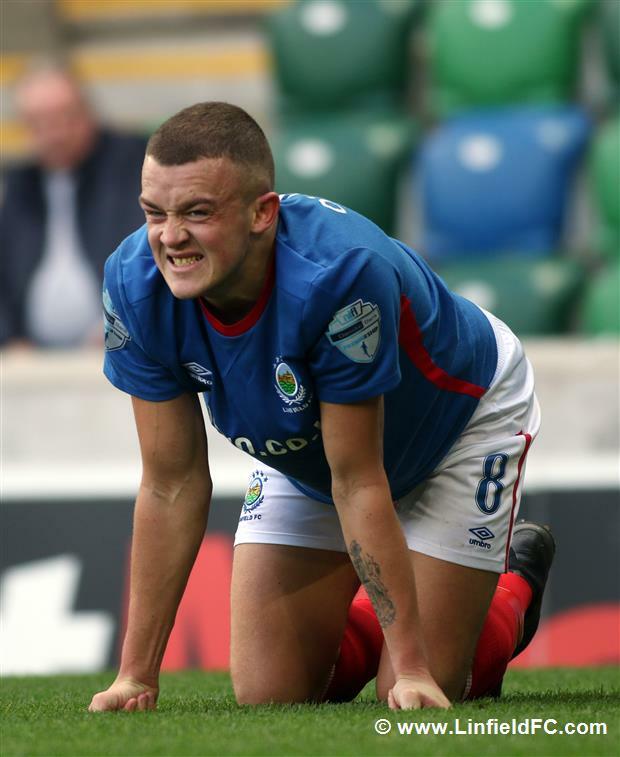 Substitute Adam Lecky also reached a stray ball and had a pop at goal but it was never troubling Roy Carroll in the Linfield goal. 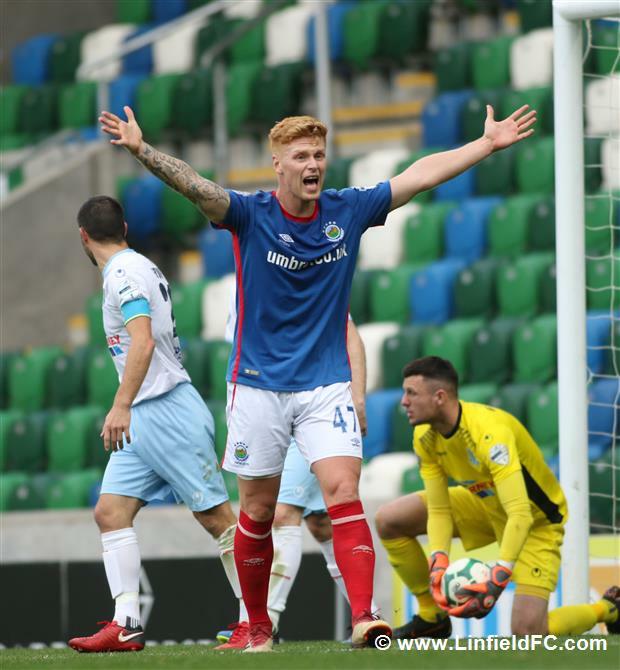 The Blues were faced with a final late scare when Johnny McMurray produced a moment of class to flick the ball over a defender’s head and volley at goal, marginally missing the target as it whistled past the post by a matter of inches.